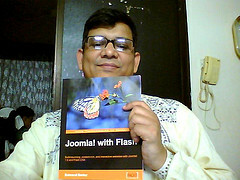 After returning home from Office, I found that my copies of Joomla! with Flash has come to post office. The postman has left a slip and asked to receive the parcel from the post office. I went with my family, and received the parcel. Then moved to Coffeeworld. Those who have authored a book knows how one feels seeing his/her book published. The book looks fine. Flipping over the pages I could not find any mistake. This book is about 240 pages and looks thinner than my other books. Here are my photograph with the book.